Do you have anything in print or an article you know of for kids to help explain why they wear ashes on their forehead on Ash Wednesday to their classmates at the public schools? I know the reasons and such but from an elementary child’s perspective would help. Off hand, I don’t know of an article and I did a lot of Web searching only to find site after site offering adult explanations with encouragement to “explain the significance of Ash Wednesday and Lent to your children,” without offering specific strategies. So, without further adieu, here is my attempt to provide children with the language to explain to their public school classmates why they are wearing ashes. Q: Hey, your forehead’s dirty. What’s that on your forehead? Q: Why did your church put dirt on your forehead? A: It’s not dirt; they’re ashes. Today’s Ash Wednesday, the first day of Lent. Catholics wear ashes to show that we want to change to get ready for Easter. Q: Are they supposed to be in a shape or something? Just looks like a smudge to me. A: It’s supposed to be in the shape of a cross—like the one that Jesus died on. Q: So you think you’re something special because you’re wearing ashes on your forehead? A: No, just the opposite. It shows that without God, this is all we are—ashes. It’s a way of admitting how much we need God. Q: So how’re you gonna change? Gonna become all holy on us? A: Just trying to become what God wants me to be—a good person. Q: I hear you guys give up stuff for Lent too. What for? A: Giving up stuff—like snacks or watching TV or swearing—is kinda like exercise. It’s hard work, but it makes us stronger. Q: So you can’t have any fun for how long? A: I can still have fun; I’m just gonna be doing some stuff a little differently for 40 days—that’s how long until Easter. Q: Then you can go back to being your old self? A: No, that’s the point. Hopefully I’ll be an even better version of myself! What parts of this dialogue are most realistic/unrealistic? What would you change or add? Of course, if you find this helpful, print it out and use with your children. Had a couple skeptics last night at my class with regard to the Ash Wednesday FAQ’s that were posted which resulted in my asking my 7th graders if any of them have ever snuck in the bathroom and washed off their ashes….and a couple said yes because they were too embarassed to answer questions about them (public schools of course). I told them I had been in the same boat at times (even when I was an adult) and not to be ashamed of that. I moved on to talking about things we can do during Lent like attending the stations of the cross at least once on a Friday or using our operation rice bowls rather than “giving something up”. I pointed out that it takes TIME to be strong about something like explaining our wearing ashes on Ash Wednesday and that doing things duing lent makes us stronger. Joe, I think I saw this on your video…..I pointed out that the term “discipline”, which is something we need during lent, comes from the word “disciple” and explained the corrolation between the two word and the whole class looked at me like “wow…..we get it now”……I’m discovering it is always something easy like this corrolation that opens the eyes of my students. Thanks. Let me know if anyone ever comes across this skepticism about Lent or Ash Wednesday or any Catholic practices for that matter (I’m sure someone does if they are junior high catechists!). Greg, thanks for telling us about your “skeptics!” I think it’s pretty common for kids that age to just want to blend in with the crowd and not stand out. Ashes will certainly make you stand out! It’s great that you were able to make the light bulb go on for some of them. Those are them moments we cherish as catechists! So explain why we walk around with ashes on our foreheads all day when the exact Gospel reading from Matthew seems to tell us the opposite? Jenn, this is a very good question and one that I think about every year. Jesus is challenging us to not be superficial in our efforts to grow closer to him. If we wear ashes to show off our holiness, then we are no better than the Pharisees whom Jesus called hypocrites. Our ashes are to be worn in humility, not as a show of holiness, but as an outward expression of our inward desire to grow and change. The ashes do not announce holiness to others, but rather, sinfulness from which we must repent. 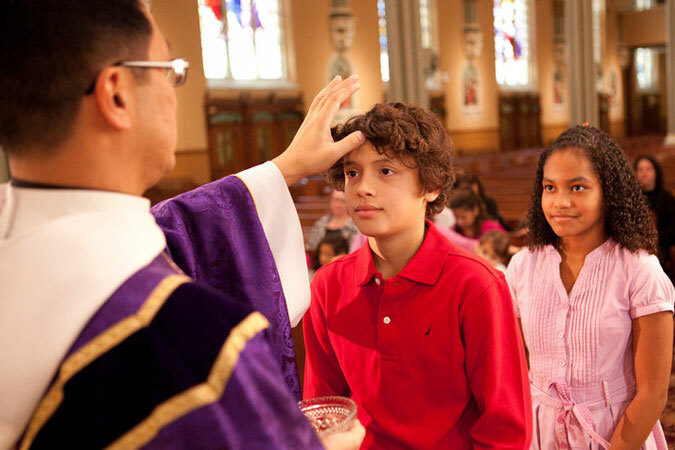 Catholicism is sacramental, meaning that we use outward signs to express inner realities. These outward signs or outward expressions reinforce and make manifest our inner realities. The ashes should serve as a reminder to ourselves that we have inwardly committed to changing our lives and following Jesus. Having said all that, no one is required to wear ashes on Ash Wednesday. We are all welcome to however if you do not feel that wearing ashes is an expression of your own personal spirituality, you need not wear them. Thanks, Jenn, for your thoughtful question. Very good article Jenn. I have been saying the same thing for a long time. Your article explains why I don’t get ashes. Thanks! I feel like so many people get ashes just because that’s what we do as Catholics… just like not eating meat on Fridays (and going to Red Lobster and spending $20 for a lobster instead). That is a judgemental statement because I can’t judge what is inside of them. But, sometimes I’m not sure people understand the point… which can be said for Sacraments too (being a DRE). But thanks for your answer… thinking of it Sacramentally makes sense… and brings me back to my Sacramental Theology class of remembering there are many sacraments in life (small s). Whether I get ashes or not… I know what I’m committed to this Lent and that is between God and I. Thank you! This is an awesome blog. Jenn, well-said. It’s our job as DREs and catechists to help Catholics understand what it is that they are doing so that they are not just going through the motions. Keep up the good work. Yesterday I wanted to prepare a class of 2cnd graders for Ash Wednesday. The assistant who works with me placed ashes (fake of course) to really drive the point home it was a huge success. Thanks for the great simple explanation. I teach Special Needs PSR, and I was looking for a way to explain Ash Wednesday to them. I’ll be incorporating some of your ideas into this week’s lesson (and bookmarking your site to come back again). Glad I can be of help, Kathy! Thank you for the insight. My boys just moved from Catholic to public school and I am worried that they might get some teasing from thier schoolmates. I am teaching some pre schoolers. I like to teach them some songs on Lent. Anyone has any suggestions? I interpret Mathew 6:17-18 saying don’t look dismal just to get attention from others. Its like donating to charity and having the act published. Rather do everything in honor of God and not worry what others think. Like when you give thanks for your food and it happens to be in public, your giving thanks to God because you honestly appreciate it not so others can see. Don’t shy away from public acts towards God because you feel shameful: Mark 8:38 “Those who are ashamed of me and of my words in this adulterous and sinful generation, of them the Son of Man will also be ashamed when he comes in glory of His Father with the holy angels.” Do it for the connection with God, who will see it comes from the heart. You’re right, Alicia, it all comes down to one’s motivation.